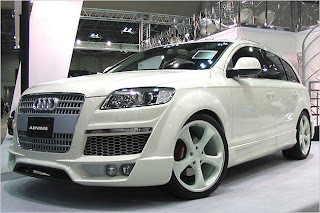 Tuning specialist Anderson Germany has got its hands on the most insane version of Audi's Q7 SUV, the flagship V12 TDI model. In stock form, the 12-cylinder oil-burner generates an output of 500 horsepower and a ludicrous 1,000 Nm (757.56 lb-ft) of torque from six liters of displacement, enough to get the all-wheel drive model to 100km/h (62mph) in 5.5 seconds. A new air filter and software optimizations from Anderson Germany help increase output by 10 per cent to 550-horsepower. The tuning firm also fitted the Q7 V12 TDI with new brakes featuring eye-popping red-calipers and a lowering module for the suspension. Next up on Anderson Germany's list is the exterior enhancements, which come in the form of a carbon fiber package for the front grille surround, mirror caps, rear diffuser and roof rails, while all logos, the air-vents, the twin tail pipes and the grille are finished in a shiny black color. The smoked lights at the back and a new set of 22-inch alloy wheels with black spokes shod in 295/30 22 tires all around, are also part of the package. For the interior, the tuning company proposes white carbon-applications on the dashboard, steering wheel and doors, while the seating surfaces and door panels are upholstered in leather and quilted black Alcantara with contrasting white seems. Optionally, Anderson Germany also offers a matching child seat. The new LED lights round off the interior upgrades. The German tuner has not given pricing yet on the new Q7 V12 TDI package.